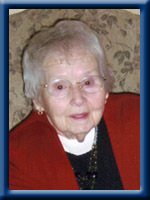 Clattenburg, Ruby Pearl, 91, of Brooklyn, Queens County, passed away Sunday, November 27th, 2011, in Queens General Hospital, Liverpool. Born in Milton, Queens County, on October 31st, 1920, she was a daughter of the late Milford M. and Annie (Hall) Gardner of Brooklyn. Ruby was in the first graduating class of the then new Liverpool Regional High School in 1938. On February 26th, 1943, she married Gerald Clayton Clattenburg, from Port Medway, in a service held at the Brooklyn United Baptist Church. While Gerald served overseas during World War II, Ruby worked in Halifax. Following the war, Ruby and Gerald operated the Modern Lunch Restaurant in Brooklyn until 1967. From 1967 until her retirement in 1984, she worked side by side her husband at the Liverpool Co-op Store in Brooklyn. In her younger years, Ruby played broomball, curling and golf. In past years, she was active in the Brooklyn W.I.N.S., the Canadian Red Cross and the Queens County Branch of the Arthritis Society. She was a member of the Seaside Seniors and Brooklyn Seniors Clubs. She was an avid reader and enjoyed playing cards. In retirement, Ruby and Gerald shared the joy of travelling to Alberta, British Columbia, the Northwest Territories, Bahamas, Florida and Bermuda. Ruby was also a life long member of the Brooklyn United Baptist Church. She is survived by sons Rodney, of Brooklyn; Barry, of Edmonton, AB. Sister Ruth Norton Murray of Liverpool, brother in law Ernie Lloyd of Bridgewater, sister in law Evelyn Weeks of Ottawa and special niece Delitha Norton of Liverpool. She was predeceased by her husband Gerald in 1992, sister Nellie in 2008 and daughter in law Beth in 2011. Cremation has taken place under the direction of Chandlers’ Funeral Home, Liverpool. In keeping with Ruby’s wishes, there will be no funeral service. Interment will be in Seaside Cemetery, Brooklyn. Family flowers only, donations may be made to any charity. Online condolences may be made at www.chandlersfuneral.com. Ruby’s family sincerely thank Dr. Tim Woodford, Region of Queens Home Support team, Queens County Branch of V.O.N. Home Care for the exemplary care and support. so sorry to hear of your lose she was very nice …. So sorry to hear of your Mom’s passing, I talked to her last year and she was really good, she is one of the last of Dad and Moms long time friends, they had so many good times and so did we as kids. Keep her memories close, they help you in your sad times. If you need anything let me know. Rod and Barry, we are so sorry to learn of your Mom’s passing. She was a great lady and fine neighbour. She will be greatly missed. Know that she lived her life for God and that she is with Him now. She has earned her reward and I am sure is with your Dad now. If there is anything we can do, just let us know. We are keeping you in our prayers. So sorry to hear of your mom’s passing. My thoughts & prayers are with you all at this time of sorrow. God Bless. Rodney and Barry, so sorry to hear of your mothers passing. Just want you to know our thoughts are with you.I remember when I worked for your dad and mom at the Modern Lunch. Rodney you sure did enjoy teasing the help. I remember those times with fondness. Rodney and Family: So sorry to hear of your mothers passing.My prayers go out to you all.Keep the memories of her in your heart forever.May she rest in peace. I am so sorry to hear of Ruby’s passing. She was an amazing lady and I will miss her. RIP Ruby. My thoughts go out to the family. So sorry to hear of your Mom’s passing.She certainly was a lovely person and will be greatly missed. Rodney, Barry so sorry to hear of your loss but just remember the good times you had with her growing up with you. Bless you both and all the best in the future. Roddy – sorry to read of your Mom’s passing. sorry for your loss. i’m sure your mother appreciated your dedication to her over the years rodney . hopefully time heals the wound . our thoughts are with you at this sad time . drop in anytime rodney . sincerely brenda and jim . Rodney & Barry – Our deepest sympathy to you in the loss of your wonderful Mom. Enjoy the memories you have of the times you spent together as they will help in the days to come. Our thoughts & prayers are with you. God bless. Rodney and Barry. My sympathy to you in the passing of your mother. I have many happy memories of her at the Modern Lunch and I trust your good memories will help you through this difficult time. Rodney and Barry. My deepest sympathy to you in the passing of your Mom. I have many memories of your Mother, Father & your Aunt Ruth, when I worked for your parents. All the memories of your Mom, will get you through this difficult time. So sorry to read of the passing of your love one. A mother is such a cherish person. Know that our Heavenly Father Jehovah cares for you in your time of loss. Please find comfort in the following scriptural passage. 2 Corinthians 1:3 Blessed be the God and Father of our Lord Jesus Christ, the Father of tender mercies and the God of all comfort. I am so sorry to hear of ruby’s passing ,i enjoyed our visits when i had her for homecare,we shared alot of the same interests, traveling and reading. i will miss our visits. rest in peace ruby, you were a fine lady. god bless you . We are so sorry to hear of your mother’s passing. She was a dedicated mother and community worker. She was a long time dedicated supporter of The Arthritis Society and a pleasure to work with over many years. Our deepest sympathy.. Sorry to hear of your loss. Our sincere sympathy to the family. Sorry to hear of your Mom’s passing. My sympathy to the family. Rodney & Barry, so sorry for your loss. Ruby was an icon on the hill and will be missed. Thinking of you both. We were very sorry to hear of your Mom’s passing. I haven’t seen her in years but will always remember the times they spent at our home and the times we all spent together. Our thoughts and prayers are with you during these difficult times. Take care. So sorry to read of your Mum’s passing. She was a lovely person and she and Gerald were great friends of my Mum and Dad. We used to play canasta with them when they came to our home. Our thoughts and prayers are with you at this most difficult time. Ruby was a great lady, it was my pleasure to be one of the women, who came ,to her home to play 45,s many times and to have her here, my sympathy in your loss. to Ruby’s family, i was very sorry to hear of Ruby’s passing, she was a great lady. many fond memories remain of growing up in Brooklyn with my friends there, visiting the Modern Lunch, the good food and playing the juke box and i thank you for that. Sorry to hear of your mom,s passing. Ruby was a lovely lady. Although she is gone, memories of her will never be forgotten. Our Sincere Sympathy to you at this sad time. Sorry to hear of your mom passing. You will miss her , I’m sure you have many happy memories of her. Our sincere sympathy to you at this difficult time. Our deepest sympathy to you both in the passing of your mother. Keep her memories close as they will help you both at this difficult time.